The first chapter of BRICS (Brazil, Russia, India, China and South Africa) was held in 2009, in Yekaterinburg, Russia. 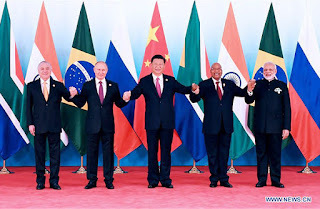 The first BRIC Foreign Ministers’ Meeting was held in 2006 among China, Brazil, Russia, and India on the margins of the general debate of 61st Session of the United Nations General Assembly, which drew the prelude for BRIC cooperation. To date, 8 summits have been held. The ninth edition of the BRICS Summit, underway in Xiamen, China is centered around the theme of ‘Stronger Partnership for a Brighter Future’. In these 10 years since its inception, BRICS has been a center for solving issues that are related to its member countries. This year, BRICS Annual summit is taking place in Xiamen, a coastal city of China. The foundation of BRICS was to improve bilateral relations, finance, business, trade, agriculture, education, health, science and technology, culture among its members and developing together to create a livable planet and environment for growth to developing countries. Cooperation mechanisms such as the New Development Bank, Contingent Reserve Arrangement, Business Council and Think Tank Council have been established. Pragmatic cooperation has gone to a greater depth to yield more fruitful results and exerted important influence globally. BRICS countries come from Asia, Africa, Europe and America and are all members of the G20. Together, they account for 26.46% of world land area, 42.58% of world population, 13.24% of World Bank voting power and 14.91% of IMF quota shares. 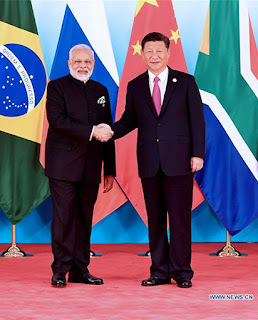 According to IMF’s estimates, BRICS countries generated 22.53% of the world GDP in 2015 and has contributed more than 50% of world economic growth during the last 10 years. This year Leaders have condemned Terrorism and are going to focus more on, Lashkar-E-Taiba, ISIS like terrorist organizations, so they have promised to work together for eliminating terrorism and improving cooperation among the members. One must also note that recently we have ended up with a conflict over the construction of a road by China in Doklam. 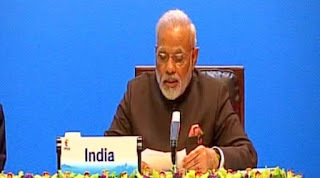 It attracted global focus, so it is interesting to note that on Tuesday, 5th September 2017, during the meeting of Indian Prime Minister Shri.Narendra Modi with Chinese Premier Xi Jinping, they can have a bilateral on the issues of Doklam and Pakistan. Interestingly Current trade between both countries (China and Pakistan) is at $9 billion, making China the largest trade partner of Pakistan. China is also constructing an economic corridor between the two countries and somewhat helping Pakistan against India. Well, in BRICS China also condemned the act of Terrorism in neighboring (Indirectly the focus was on the organizations stationed in Pakistan). 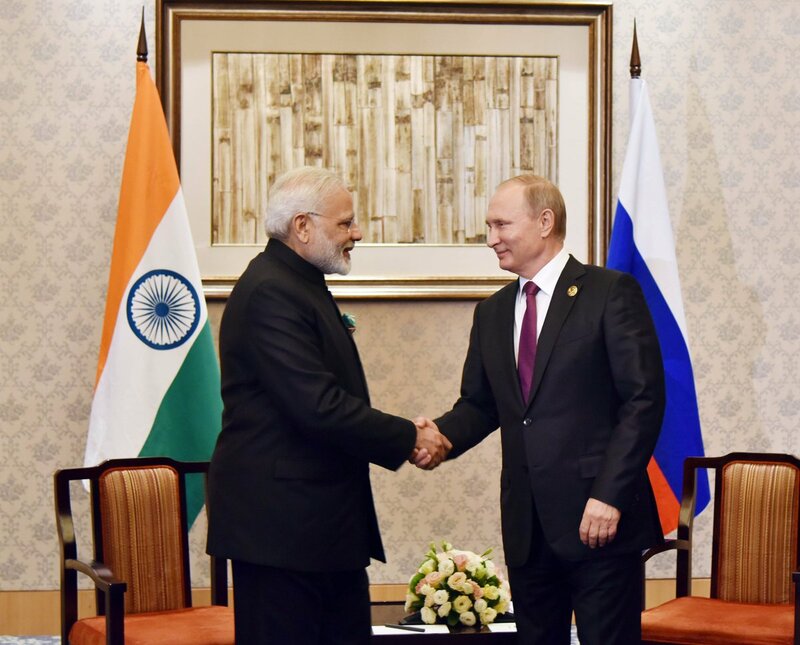 In their declaration, BRICS leaders express concern on the security situation in region, and violence by terror groups such as the Taliban, al-Qaeda and Pakistan-based LeT and JeM. 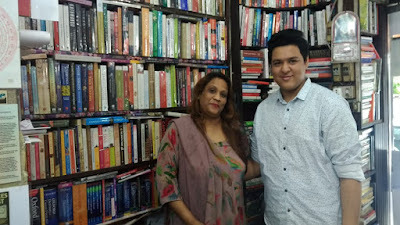 They condemned terrorism in all forms and manifestation whereever committed and by whomsoever and stress that there can be no justification for any act of terror. We call upon the internation community to establish a genuinely broad internation counter-terrorism coalition and support the UN’s central coordinating role in this regard. We, in this regard, express concern on the security situation in the region and violence caused by the Taliban, ISIL/DAISH, Al-Qaida and its affiliates including Eastern Turkistan Islamic Movement, Islamic Movement of Uzbekistan, the Haqqani network, Lashkar-e-Taiba, Jaish-e-Mohammad, TTP and Hizb ut-Tahrir. We deplore all terrorist attacks worldwide, including attacks in BRICS countries, and condemn terrorism in all its forms and manifestations wherever committed and by whomsoever and stress that there can be no justification whatsoever for any act of terrorism. We reaffirm that those responsible for committing, organizing, or supporting terrorist acts must be held accountable. Recalling the primary leading role and responsibility of states in preventing and countering terrorism, we stress the necessity to develop international cooperation, in accordance with the principles of international law, including that of sovereign equality of states and non-interference in their internal affairs. We recognize the important contribution of BRICS countries to United Nations peacekeeping operations and the importance of United Nations peacekeeping operations to international peace and security. We reaffirm our support to the people of Afghanistan in their efforts to achieve “Afghan-led and Afghan-owned” peace and national reconciliation, to the ongoing international efforts, including the Moscow Format of consultations on Afghanistan and “Heart of Asia-Istanbul Process”, as well as multimodal connectivity projects to promote peace and stability, to the fight against terrorism and drug-threat, and to the national reconstruction efforts by Afghanistan. BRICS countries are facing new challenges in economic development though their economic prospects and growth momentum remain unchanged. So, the countries are committed to promoting exchanges and good practices among the BRICS countries on innovation strategies and policies; enhancing mutual understanding which is very important for a good relationship among the countries. Strengthening cooperation in scientific and research activities, enhancing cooperation in innovation based on existing mechanisms and joint research programs including such cooperation conducted through public-private partnerships (PPP), developing and initiating international mega science programs. Encouraging technology transfer among the BRICS countries, strengthening training of technology transfer professionals, developing platforms for collaboration among businesses and academia, enabling extensive and orderly transfer and translation of innovation achievements in the BRICS countries, promoting BRICS Partnerships on Youth Innovation and Entrepreneurship to carry out pragmatic cooperation, advocating the entrepreneurial spirit of encouraging innovation and tolerating failure, and to create a favorable ecosystem for innovation and entrepreneurship amongst the younger generation. 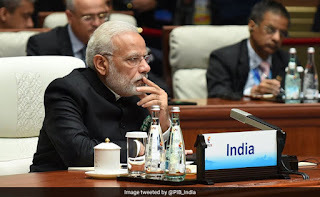 PM Modi said, “The Goods and Services Tax is India’s biggest economic reform ever.” He also added that programs like Digital India, Start-Up India and Make in India are changing the economic landscape of India. These programs are helping turn India into a knowledge based- skill supported- technology driven society. Prime Minister Narendra Modi and Chinese President Xi Jinping will hold a bilateral meeting at 10 am tomorrow on the sidelines of the BRICS summit. The meeting comes days after India and China called off their troops after a 73-day stand-off at Doklam. Sources: Official Website of BRICS, The Indian Express, Mint, Twitter.